Arrive at Cochin airport. Upon arrival meet with our representative & transfer to the hotel. Overnight stay at hotel. Today we will have full day guided tour of Cochin, the commercial capital and the most cosmopolitan city of Kerala. Visiting The Dutch Palace, Synagogue, the famous Chinese fishing nets. Afternoon free to go around the city for shopping. Evening Kathakali Dance Show. Overnight at Cochin. After breakfast drive to the temple town of Guruvayoor and visit Kerala's popular Sri Krishna temple and the colourful shops nearby. The walls of the sanctum are inlaid with exquisite mural paintings and carvings. Only Hindus are allowed inside the temple. Visit the temple's elephant sanctuary. It is situated within the compound of an old palace nearby and houses more than 50 temple elephants that are decorated for various festivals. During festivals the temples of Thrissur Pooram at Trichur 30 caparisoned elephants decorated with gold ornaments line up on opposite sides and traditional music (Panchavadyam) is played. Further visit to the Elephant Camp in the Punnathur Kotta, just 3km from the Guruvayur temple which is largest elephant sanctuary in India. Currently there are more than 60 elephants which are offered to Guruvayur temple by the devotees. The Guruvayur trip will be incomplete without visiting this elephant sanctuary. Later transfer to the hotel. Overnight stay at hotel. After breakfast we will drive to Athirapally to have the glimpse of the mighty fall of Athirapally & Vazhachal. Upon arrival check into the nature resort. Later enjoy the best of the nature around the Athirapally. Overnight stay at resort. Athirappally Waterfalls is located at the entrance to Sholayar ranges, this waterfall is a popular picnic spot. Affording to the onlookers, one of the most bewitching sights, Athirappally Falls is about 80 feet high and located in the forest area. Combined with the greenery, it infuses freshness into any tired soul. 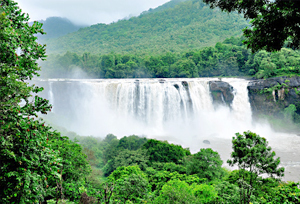 The Athirapally Falls join the Chalakkudy River after plummeting a drop of 80 feet. The charm of the Athirapally and Vazhachal nature cannot be described by words, Starting calmly from the high ranges, and crashing through gorges overhung with trees, these waterfall is one of the best places in India to re-capture a real sense of the classical idea of the 'Picturesque' - not just calm and sweet, but something wild and natural. Full day enjoy the tranquility of the nature around Athirapally & Vazhachal as it is much needed escape from the troubles and stress of life. Let the soothing sounds take you to some of nature’s most relaxing places - the beautiful waterfalls. Overnight stay at resort. After breakfast leave for Munnar, enjoying the scenic beauty & the marvelous waterfalls, high mountains with the low flying clouds passing by. On arrival at Munnar check in at the hotel. In the evening go for sightseeing of Munnar and witness it’s tea gardens spread like a green carpet over hundreds of kilometers, lush green hills, a place so difficult to describe, very low population too far from pollution, most of the covered by Tata tea. Overnight at hotel. Munnar hills is situated at an altitude of 5000 to 8000 Ft above sea level. 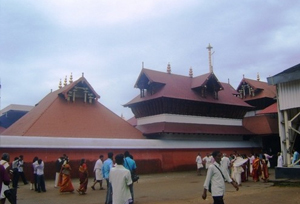 and is situated at the confluence of three mountain streams - Mudrapuzha, Nallathanni & Kundala. This beautiful hill station was once the summer resort of the erstwhile British Government in South India. Sprawling Tea plantations, picture book towns, winding lanes and holiday facilities make this a popular resort town. Today we will enjoy the sightseeing around Munnar visiting, the Raja Malai, a top peak of Munnar where you can see Neel Thar (mountain goats), Mattupetty dam, Indo Swiss project. In the afternoon enjoy boating in the Lake (optional). Overnight at hotel. After breakfast drive to Thekkady, the largest wildlife sanctuary of Kerala. The 120 years Old Surki dam built across the reserve. The sanctuary is spread over an area of 777 Sq km, surrounded by an artificial lake over an area of 25 sq km. Upon arrival check into the wildlife resort. In the afternoon enjoy the nature trek around the sanctuary. Overnight stay at resort. Periyar (Thekkady): The Periyar Tiger Reserve, named after the Periyar river, is one of Kerala's prestigious possessions on the high ranges of the Western Ghats. Falling in the Idukki district of Kerala, this forest reserve surrounds the Periyar Lake, which was created in 1895 by building a dam across the Periyar river (to divert the water to Tamil Nadu for irrigation). The forests around the lake were declared as Reserved Forests in 1899. The forests of Periyar can be divided into four categories. The open grasslands are home to the Elephants, the Bison and herds of deer. The moist deciduous forest is dominated by trees like Terminalia and Teak which shed their leaves seasonally. The semi-evergreen forest occurs along wet stream areas and is often adjacent to the tropical evergreen forest. Fourth, the 'Sholas' or tropical evergreen jungle which is typical of the entire western Ghats in the state, abounds in this Reserve. The varied habitat in the sanctuary supports a number of species of terrestrial, aquatic and arboreal animals. Apart from Elephants, other herbivores in the Reserve are Gaur, Sambar deer, Barking deer, Mouse deer, Nilgiri langur, Bonnet macaque, Lion-tailed macaque etc Tiger, Leopard, Jungle cat, Wild dog, etc are the major carnivores seen in the area. Other important animals are Bear, Porcupine, Jackal, Indian Giant Squirrel, Malabar flying squirrel, Wild boar, small Indian Civet, Mongoose and the Pangolin. 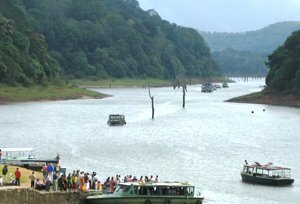 Morning enjoy boat cruise in Periyar lake to have the glimpse of its nature & wildlife. Later after breakfast drive to Alleppey, the most beautiful tourist center in Kerala state, with a large network of inland canals earning it the synonymous "Venice of the east". 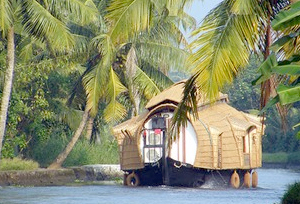 These large network of canals provide Alleppey its lifeline and immense natural beauty. Upon arrival at boarding jetty check into the house boat. Overnight stay on board. Alleppey is also known for its spectacular snake - boat races held on the second Saturday of August, every year. A singularity of this land is the region called Kuttanad - a land of lush paddy fields referred to as the Rice Bowl of Kerala and one of the few places in the world where farming is done below sea level. In this world of simple pleasures, you'll skim past Chinese fishing nets, water lilies, lush paddy fields, coir villages, rustic homes, ancient temples, churches and coconut groves. There is simply nothing more enchanting than a refreshing cruise along the gorgeous Alleppey backwaters that would make all the hard work you do throughout the year worthwhile. After breakfast disembark the houseboat and drive to Cochin airport for onward connection.